High Green Field Knott is the name given to the highest point of the northern terminus of the long Birks Fell ridge that runs the length of Littondale. 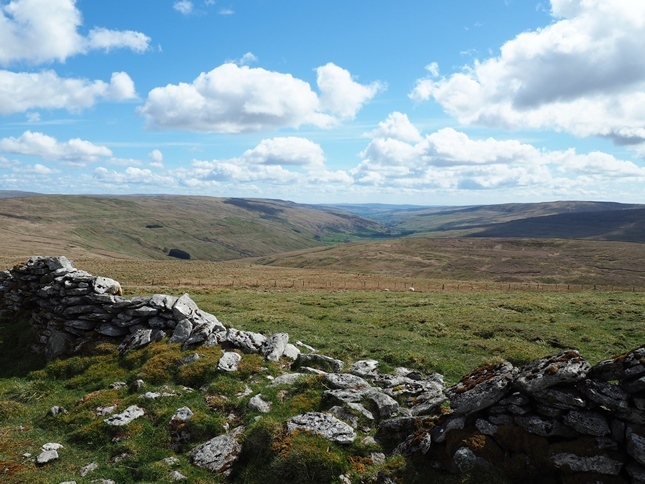 Around 13 miles in length the ridge divides Littondale from upper Wharfedale and includes three distinct summits, Birks Fell, Horse Head Moor and High Green Field Knott. 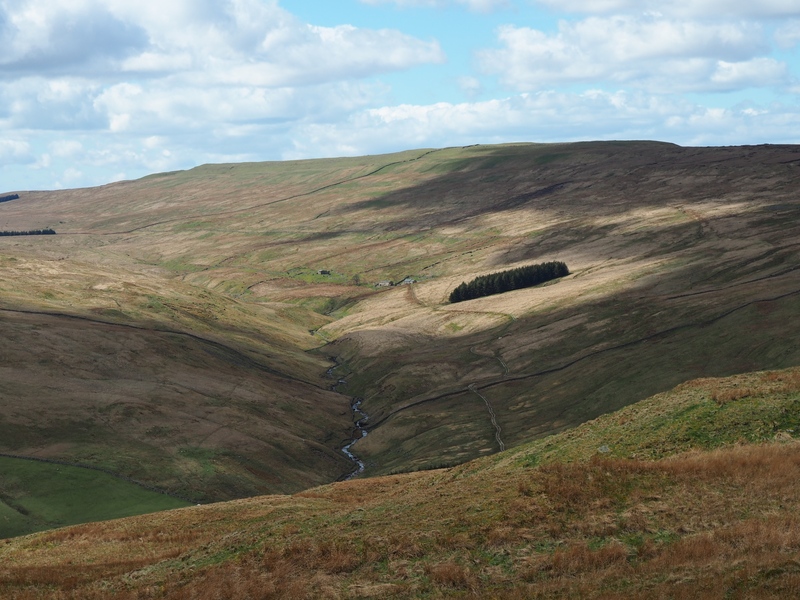 The latter stands above two of the more remote valleys in the Dales, Cosh Beck to the south and Green Field Beck. 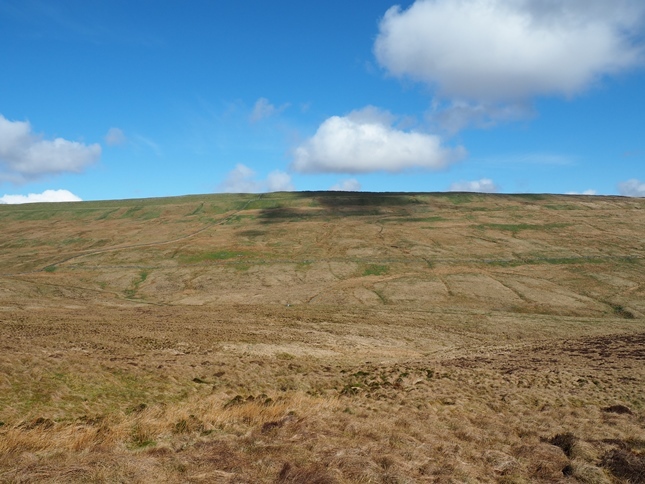 As with is near neighbours Blaydike Moss and Cam Rakes, High Green Field Knott is not a particularly well-known fell. Indeed, on looking at the map it doesn’t even seem to have a definitive name, the fell being divided up into Cosh Inside and Cosh Outside on one side and High Green Field Knott and Low Green Field Knott on its northern side. For a long time I used to refer to it as simply Cosh Fell, however the Database of British Hills has chosen to call it High Green Field Knott, despite the fact that the highest point actually lies in the quarter of the fell that is labelled Low Green Field Knott on the OS Explorer map. 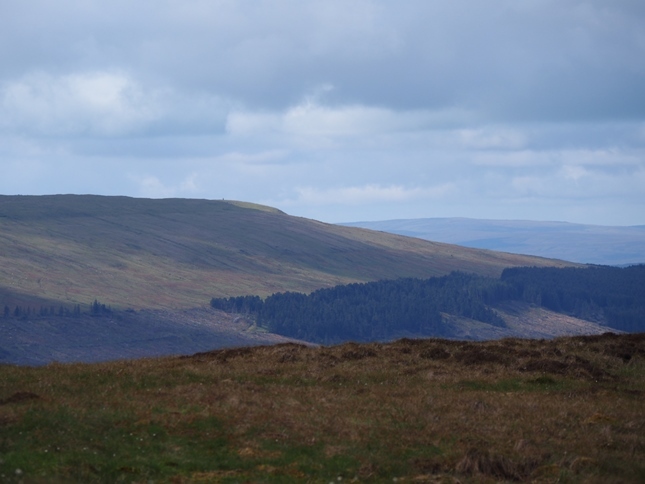 The highest point lies to the north of the wall that runs the length of the entire ridge and is unmarked by cairn or trig point. The view is a good one though it simply cannot compare to where the Ordnance Survey chose to site their trig point, just over half a mile to the west and only four metres lower on Cosh Outside. 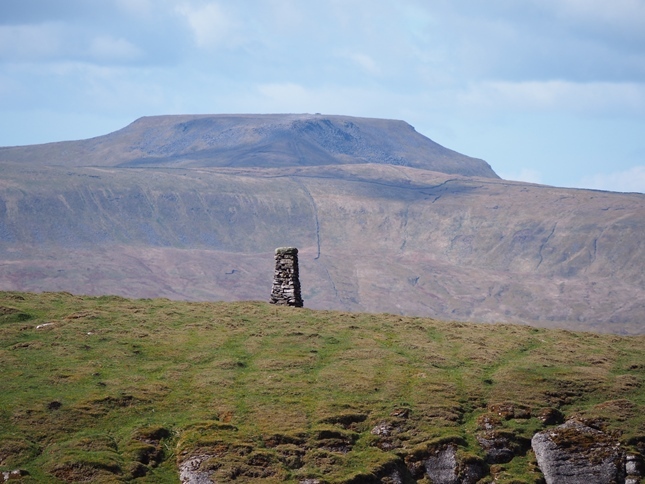 The view from the trig point is immense and features Pen-y-ghent, Ingleborough and Whernside. 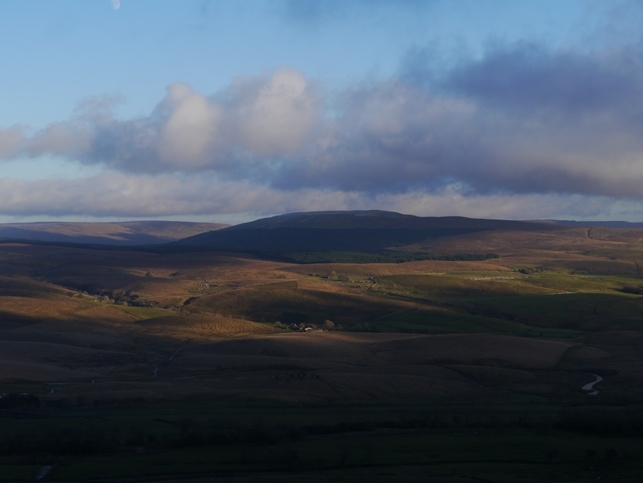 Between Pen-y-ghent and Ingleborough the Bowlands Fells and Pendle Hill are well seen. Slotting in beyond the right shoulder of Whernside are the Howgill Fells. To the north and east a host of other fells can also be seen including Buckden Pike and Great Whernside above Horse Head Moor. At the western terminus of High Green Field Knott, just beyond the trig point on Cosh Outside is Cosh Knott. 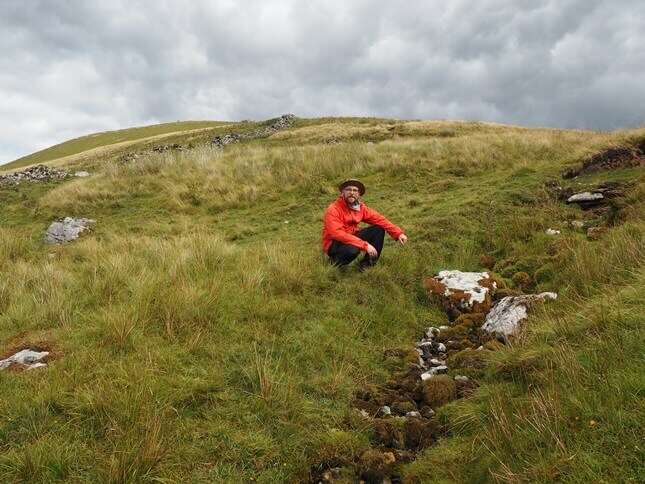 Cosh Knott is a limestone knoll topped by a superb 8ft high cairn that so far seems to have escaped the attentions of Ordnance Survey mappers. Again the all round view is quite magnificent. On the western side of Cosh Knott lies Cosh Knott Well which I’ve seen referred to as the true source of the River Wharfe. Sadly I can no longer find the website that made this claim. On the off chance it is correct I made a point of visiting the spring on my third visit to High Green Field Knott. To do so I took a roundabout route up the Greenfield valley. 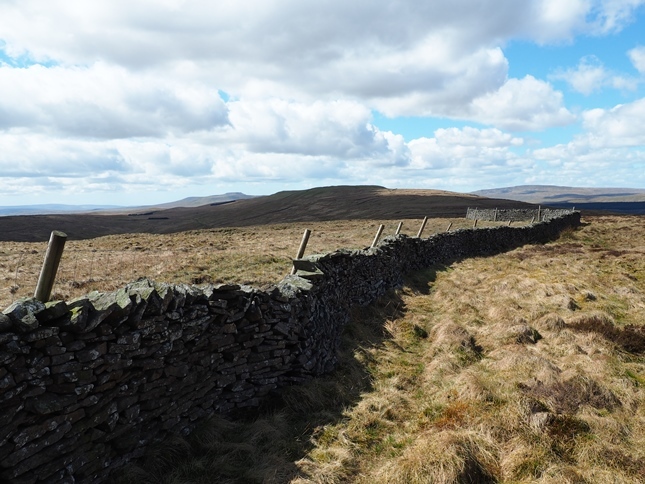 Having passed through the plantations at the head of the valley I then climbed up Birkwith Moor to reach Cosh Knott Well. 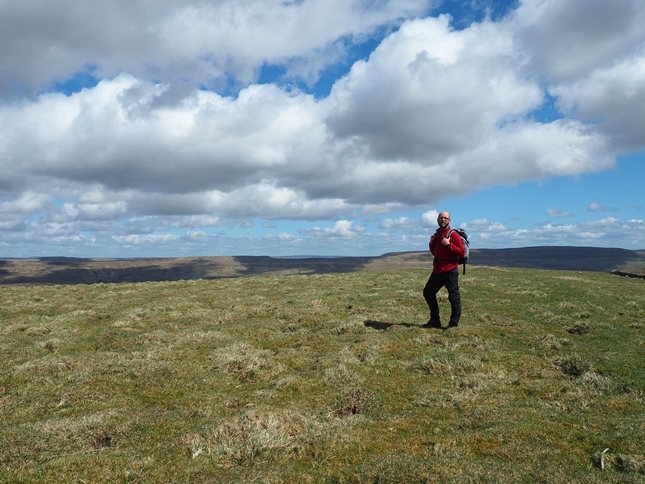 The best approaches to High Green Field Knott start from Halton Gill in the upper reaches of Littondale. A few options are available. The first is to follow the track to Cosh House and then on to Cosh Beck Head Caves. From there it is a fairly simple climb up grassy slopes. The other two options both involve joining the faint path that follows the wall along the ridge. This can be joined either by taking the path slanting across Great Pasture or by taking the superb track winding its way up to Horse Head Gate. Based almost solely on my second visit to the fell, in May 2015, High Green Field Knott is one of my favourite fells in the Yorkshire Dales. It was a spectacular day of blue skies, cotton wool clouds and superb visibility. This was in complete contrast to my first visit, a miserably wet day where visibility was virtually nil. 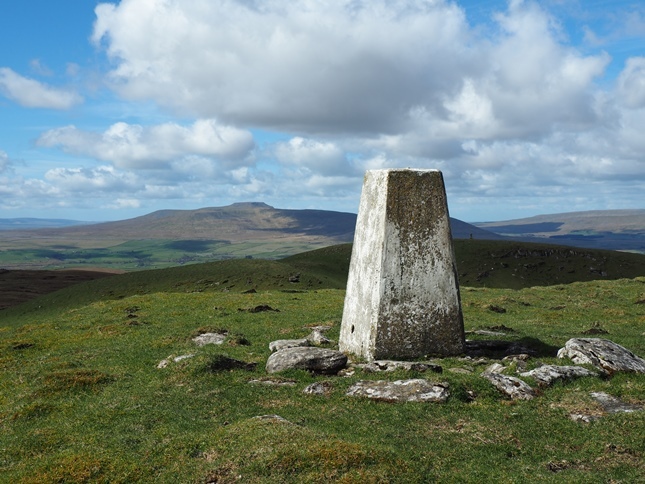 While the summit itself is not much to write home about the panorama from the trig point and Cosh Knott are in, my humble opinion amongset the finest in the country.